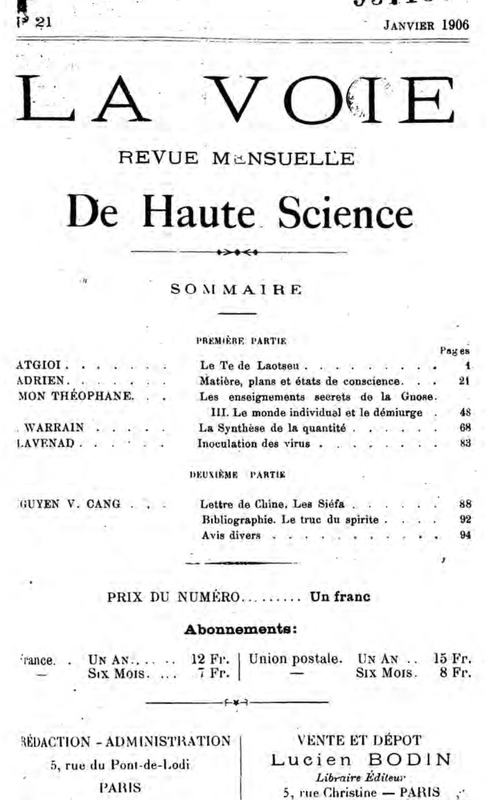 Revue mensuelle de Haute Science. Paris, France. Language: French. Publisher: Lucien Bodin. Editor: Albert de Pourville. 1/1, April 1904-May 1907. 96 pp., 12 francs (15 in Postal Union)/year. Notable especially for its emphasis on the occultism of the Far East (the title of the journal is a translation of "Tao") and in Islam. Contributions by Fabre des Essarts, Joanny Bricaud, "Alta" (Abbe Melinge), "F.-Ch. Barlet" (A. Faucheux), V.-E. Michelet," J. Giraud (regular articles on hashish), Leon Combes, Albert Jounet, Leon Champrenaud, and"Matgioi" (Albert Puyou, Comte de Pourvourville), the last two of whom were very influential in the development of Rene Guenon. Several of Matgioi's articles from this journal were published in turn in Maria de Naglowska's La Fleche. Dorbon 6695; BM Lyon.